Flying Horses opens on April 15, with six newly refurbished panels. Each year in the fall, after the Wurlitzer music has quieted down at the Flying Horses and the carousel prepares for its winter hibernation, routine maintenance is required. After all, the hand-carved horses with their genuine horsehair manes and tails take a beating carrying countless riders. Myles Thurlow works as the resident mechanic and horse knee-doctor (he replaced four horse knees this winter). 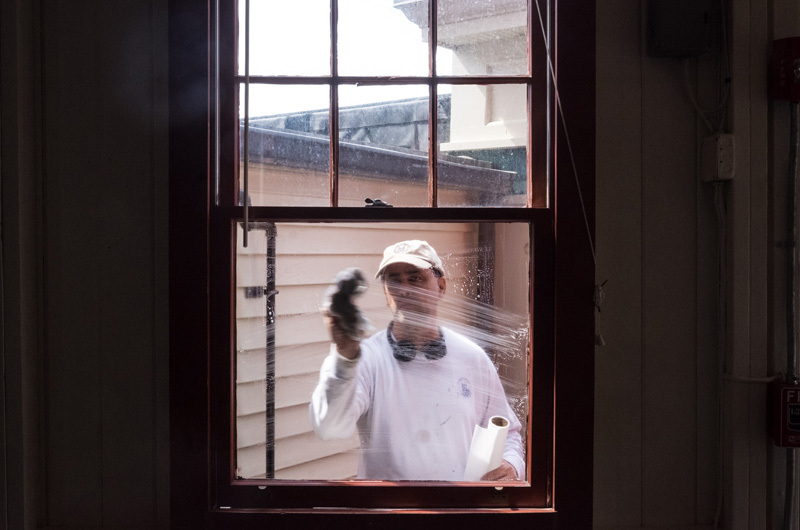 John Anderson does general painting and keeps the horses’ coats shining. 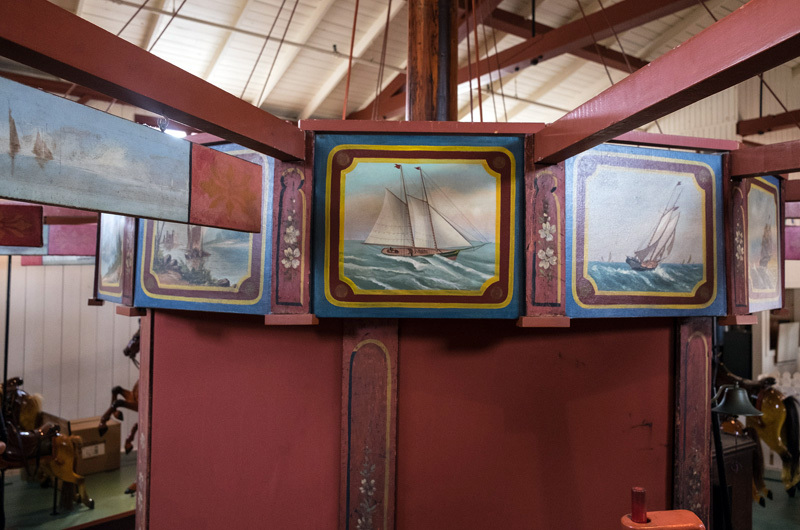 And this year, Margot Datz joined the off-season team, focusing on the painted panels that decorate the center column and the spokes of the carousel. The carousel opens for its 142nd consecutive season on Saturday, April 15, when the Martha’s Vineyard Preservation Trust will unveil the newly refurbished panels. The trust took ownership of the carousel in 1986. Ms. Datz recreated six panels, featuring river scenes and ships. On Wednesday morning, the new panels were hung on the carousel, after being stored for over 20 years, too degraded for display. “Whether it’s a merry-go-round panel or the Mona Lisa, restoration is the same very fastidious process,” said Ms. Datz by phone. “Most of [the panels] were torn, almost impossible to see the images. [Chris Scott] showed them to me and asked me if I could recreate them. 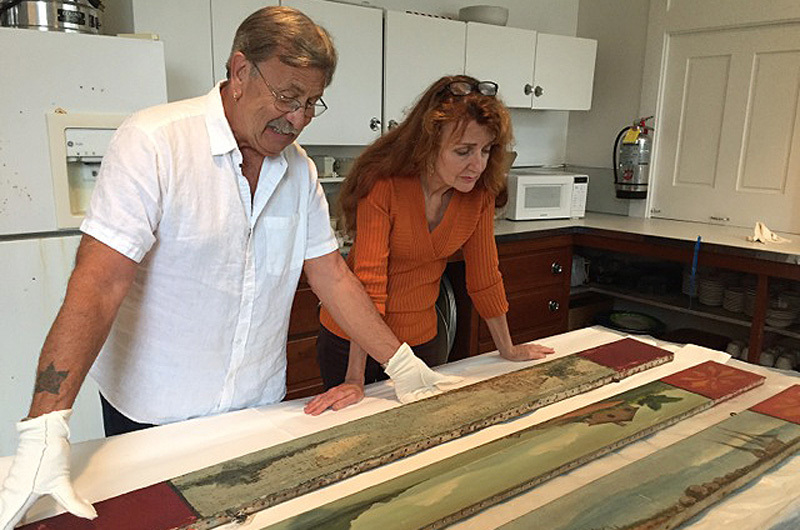 I knew that I could.” Ms. Datz previously worked with the trust in 2013, restoring the murals in the Old Whaling Church. To get as close to the originals as possible, she hired her brother, Stephen Datz, to build frames to stretch the canvases in the same way as the originals. Then she carefully inspected the panels, noting brush work, color scheme and style. While Ms. Datz said she could find no information on who the original painter was, she suspected they were painted factory style by more than one artist. “The decorative surrounding was painted by one artist, another did the roses at the bottom of the large pieces, another did the vignettes and landscapes . . . several hands were involved in it,” Ms. Datz said. Some of the sections were so tarnished it was hard to figure out the original design. It was a bit like detective work, she said. The largest panel, a bucolic river vignette, was particularly challenging. 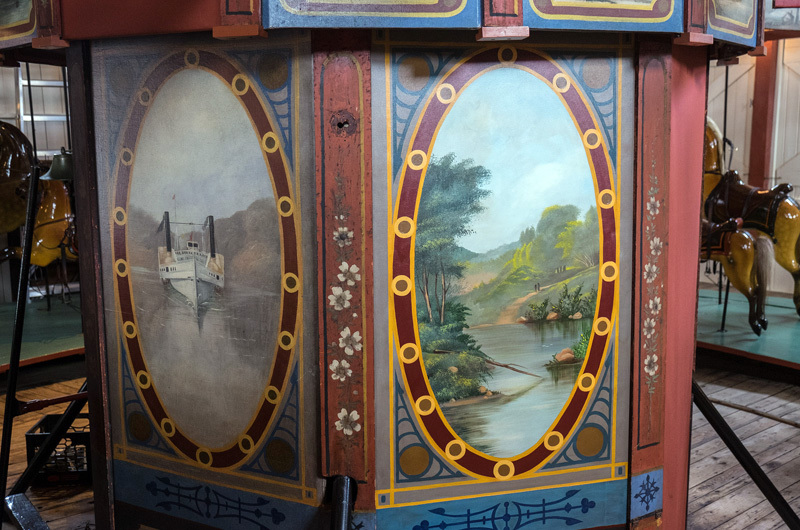 Over the years the painted panels had also changed motifs. For a while it was cowboys before switching to an Age of Aquarius theme with celestial paintings of horoscopes. The four chariots on the carousel were also the subject of past detective work. Three of them were created in a sleigh style with two rows of forward facing benches. One misfit is more like a cart with two inward facing benches. For a while, it was thought that the cart-style chariot had replaced a sleigh-style chariot, manager Robin Meader said. The trust had planned to replace the odd-ball chariot with another Charles Dare chariot they acquired, but then an old catalogue was unearthed showing the misfit was indeed a part of the original design. 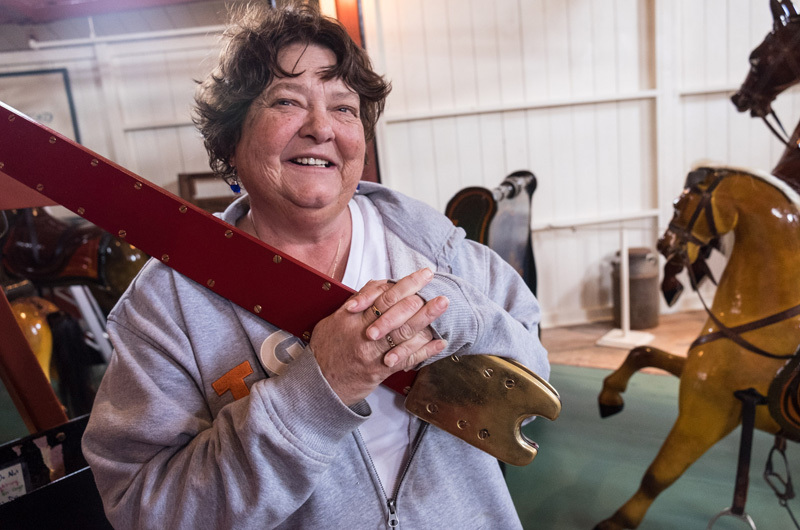 Ms. Burdick said returning the Flying Horses to its original design gives the carousel the prestige it deserves. And an important part of that prestige is that the horses continue to be ridden by Vineyard visitors and residents. When the Flying Horses opens on Saturday it will once again lay claim to the title of the oldest continuously operating platform carousel in the nation. The Flying Horses has inspired songs, poems and children’s books. And now it has inspired Ms. Datz. She hopes to continue working with the trust to recreate the rest of the missing panels. The Flying Horses opens on Saturday April 15 from 11 a.m. to 4:30 p.m. The Easter bunny will visit on Sunday. The carousel will remain open for the week of school vacation and then stay open on weekends only until school lets out. For as long as I can remember, the Flying Horses have been an integral part of my memories of summer. I first came to The Vineyard age 10 months, and am coming in August for my 62nd year. I hope everyone realizes how much these horses mean to so many young and not-so-young folks - I have passed the "brass ring" baton to my daughters, and they will hopefully pass the excitement on again. Keep flying!